The software that HJorgs.com uses, WordPress, is very simple to learn and use. The process for creating and adding content is similar to writing an email or text document. All of the updating of the website happens online, and the results are available immediately. It is strongly recommended that the web browser Firefox be used to make updates to your website. Firefox is available as a free download here. To start adding content, load the website in a separate browser tab or window and click on the Login link, located in the “Admin” menu at the bottom left. In the login menu enter the user name and password that has been provided to you by your web administrator. These are case sensitive, so check your login information for capital letters. 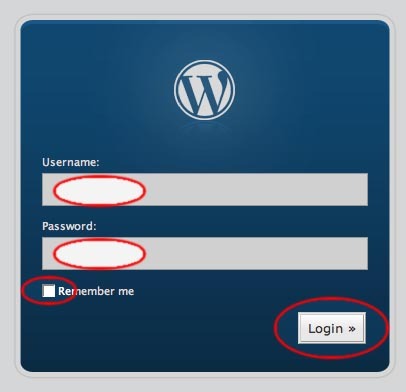 Check the box before “Remember Me” if you would like to stay logged in between sessions, and click the “Login” Button. This brings you to the “Dashboard”, the backend where changes to your website can be made. You can return to the frontend of your website from any page in the Dashboard by clicking the “View site” link at the top of the page. While you are logged in, you can enter the Dashboard by clicking the “Site Admin” link on the bottom left of the website, in the Admin section. There are five types of updates that can be made: Pages, Posts, Events, Photos, and Links. Pages are separate web pages that do not often change, such as “About” and “Contact” pages. Posts are individual entries to a single page, the “Front Page”. These are organized by date and can be used for reporting news. Events are a special type of post that are entered into the calendar. Photos or other files can be uploaded to the website and added to posts or pages. Links to other websites can also be added. If you would like to learn more about how to use your website’s tools, WordPress Lessons contains a wealth of information. The services of Herald Journal Organizations are provided by Herald Journal Publishing. Visit Herald-Journal.com to discover many other products and services that Herald Journal Publishing has to offer.